OK ladies, I am super proud of this DIY Swaddle Blanket so be nice (I know you’re always nice, but please be extra nice). This gift is destined for a baby yet-to-be-born so it’s modeled here by my other child, Scarlet’s sister, Pandy. It’s okay, you can laugh at Pandy’s forlorn, distant stare. Just don’t laugh at my attempt to show you how to make a swaddle blanket. There are so few free tutorials on how to make a swaddling blanket and so many expensive versions on the market, so I’ve been feeling them all out and trying to come up with a simple, yet effective, way to make your own. 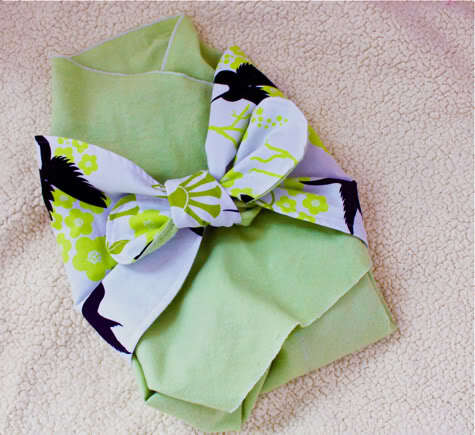 This free swaddling blanket tutorial will cost you under $5 to make with inexpensive flannel. It can be sewn in about an hour or two depending on your sewing style. Here’s a little step-by-step on how this homemade swaddling blanket works. It can be tucked or tied. Don’t worry, it works the same for pandas and babies. ***Update: I’ve heard from some test moms that tall babies can kick their way out and the blanket would be better a little longer. So you may want to just make a 2″ cut or no cut at all to leave a little extra length. You can fold 1/8″ and iron all the way around, then another 1/8″ inch, iron, pin and sew a hem, or if you want, you can cut another triangle of the same size (in the same or coordinating fabric), sew the two triangles together with right sides facing leaving a turning hole, then turn them inside out, iron flat, and top-stitch around the edge. Unfold it so your ironed edge is up. YOU ARE DONE MY FRIEND! That is a great tutorial. I have been wanting to make one, for some friends who are having babies. A couple of questions. Do you think that flannel would be too warm for babies that will be born in the summer, and if so what other material do you suggest? Second which doesn't have to do with the tutorial. I have the same serger as you and am having trouble with the green needle coming unthreaded when I use it. Just wondering if you had the same problem and if so how you fixed it? Thanks and a great job. This is awesome!! When my daughter was a babe, we just used the flannel blanket from the hospital. Your version is SO much better! Lovin' the pretty fabric tie!! It just so happens that I know of at least 4 babies being born in the next few months. Adding this to the ever growing project list!! thank you leah! my daughter was born in april and i swaddled with flannel most of the summer, but we have air conditioning. i think linen would be a good alternative for the summer, especially with a few washings so it's nice and soft. they have some ADORABLE linen prints at harts fabric. as for the needle coming unthreaded, i haven't had that problem. i imagine somewhere along the line it's getting slightly stuck, maybe the tension disk is too tight? p.s. isn't serging the most fun ever? i could do it all day. Thanks for the suggestions on the both the fabric and serger. I just got mine for Christmas and am still working out the kinks. And yes it is a blast. I am a new follower of your blog and I love it. Still learning how to use a sewing machine and everything, but these tutorials are great! I am going to be an aunt and am really excited to try all these projects out! Thank you! You and Carleton Curtis make the most beautiful babies, I swear. You also make the most beautiful swaddling blankets. I'm not kidding about the swaddling blanket, it really is to die for. If only Quinn had been born a year later, I may have been the lucky recipient. PS. My favorite swaddling blankets were made of muslin gauze. Might be worth a try for summer babies. How lovely! My son and DIL are expecting a very premature baby any day now. I will be making several of these for when he finally comes home from the hospital. Thanks so much for the tutorial! thanks for sharing this! i also LOVE the couch that bear is sitting on!!! That is a REALLY cute swaddling blanket!! I will have to bookmark this for when a new kiddo comes into our lives. Perfect! Having baby #2 in June…we didn't have a great swaddling blanket for the first babe. Now we will! Awesome pattern. Poor Sad Panda, though! It must be tough eating bamboo all day long. This is great! Super inexpensive baby gift, and you could even include a special stuffed animal swaddled up as part of the "baby shower" gift. Can't wait to get a chance to make one of these. With a little one on the way I am so excited to make use of this pattern. So adorable and functional! I linked to your pattern/ tutorial on i*heart*life. thank you so much for the tutorial it makes it look so simple ! THANK YOU THANK YOU THANK YOU! i've been looking for a good swaddler pattern for over a year now. two of my best friends are having babies this summer and i'm adding this to the list of projects for them (along with quilts, hospital-necessities kits, and nursing covers). Awesome.. thank you SO much! P.s. We have "featured on luvinthemommyhood" buttons if you would like one for your "press" section, we would be honored to send one your way 🙂 Thanks for a great site! This is adorable! My baby is due in July, but it can be pretty cold here in Michigan. I can't wait to make one! Wow is that cute! I will have to give it a try, I have some baby gifts to make! Thanks! Great Tute!!! My son always gets out of his swaddle then wakes up… off to get fabric and make one of these!!! I think you are a very talented seamstress, and I am so thankful that you shared this with us! I have been wanting to make one for a long time but couldn't find one I liked, but I have now!! Thank YOU!! Great idea! i wish i found it sooner. This is so freaking cute. I love love love it! I have so many friends that are pregnant and this is awesome! Thanks so much! This is so super cute – I can't wait to try it! Wonderful pattern. This has saved me so much $$$$. I found this pattern last night and had to look through my left-over pile of fabric to give it a try right away, I was so excited I was up until 1:00am sewing. If anybody wants more information read "The happiest baby on the block," great book!! This is SOOOO easy and my daughter loves it! Do you know of this will fit a 3 month old? He loves being swaddled and getting to big for his And i don't want to go out and get one when I have tons of material around. Thanks! Baby #2 expected in October.. So excited and this will make a great project.. May change around fabric a little as North Carolina temps may not work with Flannel but well see 🙂 THANKS SO MUCH!! Looking forward to trying this for my grand-babies! My new grandbabies will love this and so simple. Thank U very much for sharing such a Grreeaaat Idea!!!! this is a great idea, can’t wait to make one for my baby.keep up the good work. I am excited to try this for my son and give one to my sister for my niece. I found this tutorial, got all excited, and went out and got supplies before I got to the part where you mentioned you had posted an updated tutorial! Haha. I had fun making this swaddle and it turned out really cute. I will be trying the updated tutorial next, I am due in August and am in super baby crafting mode already! This kid is going to be totally set. I am glad I found your blog and tutorials, they are easy to follow and so far I am very happy with the results. This is a nice looking swaddler and easy too. I found this on Pintrest after looking around on You tube and found nothing but regular blankets. I am excited about trying this a for my niece at her baby shower. Thank you for putting this out so other can make them.